This is how Hillary Clinton came to be defined through the Australian media. And as it turns out – this was yet another example of the Australian media taking their cues from their colleagues in the US media – and we all know how reliable that has become. Later in 2016 and well before the election, I came to the conclusion that something was wrong with the messages we were hearing from just about all sources. The most blatant being some of the commentators on more respected programs such as The Drum. Sadly when negative comments were made about Hillary Clinton, at no time did anyone challenge the speaker to back up their statement with any evidence. It was always simply accepted – and often done so as if everyone agreed. At last there is a book out that may go some way to provide a version of events to the never ending supply of questionable story-lines and spin that dominated the airwaves during the election – and even continue to this day. 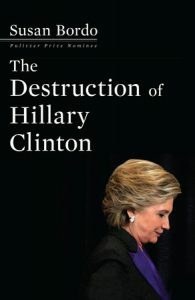 The Destruction of Hillary Clinton – by Susan Bordo. Here’s one review – there are not may and I think that is no surprise: Click here. Here’s the author writing in The Guardian about the book – and it was based on this that I bought the book: Click here. and for more on the author, Susan Bordo – click here. A big thanks to Susan Bordo for this book – it has answered my questions – but sadly reinforced my view on how easily the electorate can be fooled – and how the media has become part of the problem we face today in trying to get the democratic processes to function.